Howland Island (176.615W 0.804N) is a small island, little more than a sandbar 2 miles (3 km) long, located just north of Baker Island and about 1600 miles (2600 km) southwest of Hawaii. The island is shaped like a shallow saucer, with its highest elevation (10' or 3 meters) on the western rim, and it is heavily vegetated. It was mined for guano, but this was exhausted by 1890. A small airstrip (2400' or 730 meters) had been built here to support aviatrix Amelia Earhart's attempt at a round-the-world flight in the late 1930s, but she disappeared somewhere near the island. 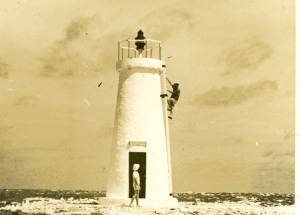 The island also had a lighthouse on its western rim. The island was heavily bombed on 8 December 1941 and subsequently shelled by Japanese warships, destroying the meager facilities. It was evacuated in January 1941, then reoccupied by Marines in 11 August 1943. By September the airfield was reconditioned but saw little operational use.